Given by Clark and Fenn Ltd. This mould is reverse-carved with a pinnacled Gothic arch and scrolling foliage. (Pinnacles are small turret-like terminations, of various forms.) On the other side of the block is a two-handled fluted urn. The mould was used for the multiple production of architectural ornament in plaster or in 'compo'. 'Compo' is a generic term for 'composition', a paste or putty. It usually consisted of four basic ingredients: whiting, glue, rosin and linseed oil. Reverse-carved moulds of this kind were widely used from about 1780 until about 1900. Initially, the ornament was produced by pressing a thickness of 'compo' into the oiled mould, and squeezing it in a screw press. The pressing could then be removed from the mould in a still warm and flexible state and applied to the surface to be decorated. The use of moulds to make reproduction ornament greatly reduced the demand for ornamental carving in wood. Composition manufactories, as well as firms such as carvers and gilders, used moulds and commissioned them from specialist workshops. 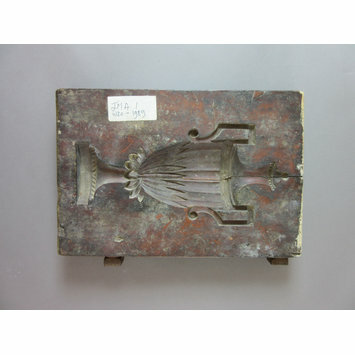 This mould comes from a collection of moulds that the London firm of George Jackson & Sons Ltd (trading in 1780) gave to the Museum in 1988, when they became a subsidiary of Clark & Fenn Ltd. Jackson's had acquired moulds from other companies, such as the London-based firm of Brown's, who went out of business in the first half of the 20th century. It is thus unlikely that they made the whole collection of moulds. A reverse carved mould, possibly made of fruitwood. The design on the first face consists of scrolling foliage and a gothic arch with stylised ivy leaves. The initials "GS" are stamped/impressed on this side. The left end is sealed with cream paint over which is written "A1" in black (and similarly to the right end). The design on the second face is an urn (fluted) with two handles. There are bolts with washers running laterally through the mould to secure the split through the length of the block. The initials "GS" are impressed/stamped in the wood on the face ornamented with scrolling foliage and gothic arch and ivy leaves. The left edge is sealed with cream (discoloured) paint, and "A1" is written in black. The right edge is sealed with darker paint (discoloured) and "A1" is written in black. 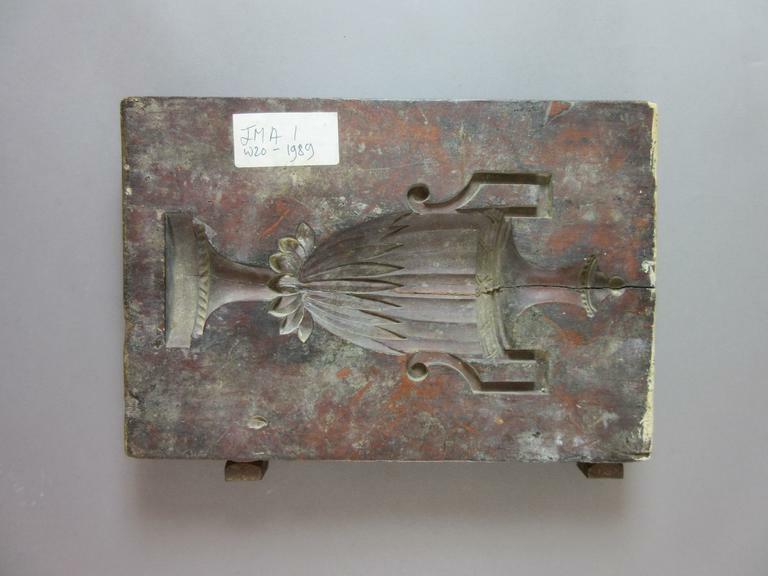 These reverse carved moulds were used in the late 18th and throughout the 19th century to produce architectural ornament from mould making materials such as "compo". Composition manufactories, in addition to firms such as carvers and gilders, used these moulds which were commissioned from carvers' workshops. It is thought that the Adam brothers played a major role in the initial manufacture of ornament on a grand scale in this way, and are rumoured to have employed a George Jackson (1756-1840), the founder of the present company, George Jackson & Sons Ltd. (a subsidiary of Clark & Fenn Ltd.) Thus the turn of the 18th century gradually witnessed a sharp decline in the number of carvers, those still remaining in employment often working in reverse as opposed to relief, to create the moulds. Initially, the ornament was produced by pressing a thickness of compo into the oiled mould, and squeezing it in a screw press. The pressing could then be removed from the mould in a still warm and flexible state and applied to the substrate. Towards the middle of the 19th century, machines were introduced and more widely used in the production process. The mould was made for the mass production of architectural ornament from moulding materials, such as "compo" (a generic term for the paste or putty, usually consisting of four basic ingredients: whiting, glue, rosin and linseed oil. This was used in the late 18th and early 19th century). It may have been commissioned from a carving workshop by the London based firm, Brown's, who are thought to have been bought out by the firm of George Jackson & Sons Ltd. in the first half of the 20th century when Brown's went out of business. These moulds were offered to the Museum in 1988 when Jackson's became a subsidiary of Clark & Fenn Ltd. Some of the moulds have a name or intials such as "GS", which are thought to relate to their respective carver. Hitorical Context Note: These reverse carved moulds were used in the late 18th and throughout the 19th century to produce architectural ornament from mould making materials such as "compo". Composition manufactories, in addition to firms such as carvers and gilders, used these moulds which were commissioned from carvers' workshops. Historical significance: Many of the designs are in the classical style, suggesting a late 18th and early 19th century date, however others are clearly mid and late Victorian. Further research will help to establish their date through their style of pattern. The majority of the collection (without further analysis) seems to be made of box and various fruitwoods. However other woods are in evidence for exmple, the supporting blocks for the finer strips of boxwood, into which the ornament has been carved. The presence of machine planer marks are in evidence on many of the moulds, which will assist in establishing their date. Others have no such evidence, and hand cut fixing such as nails. There are many beautiful examples of the carver's art within this collection, particularly those bearing the initials or names of the carvers. Reverse carved, fruitwood mould. Late 18th/19th century. Though there is no evidence to suggest that these moulds were actually made in London, it is thought that Jackson's acquired moulds from another London company, possibly Brown's. Attribution note: For the production of architectural ornament.